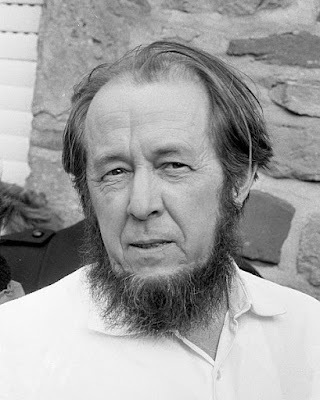 As History.com notes, today is the birthday of Russian writer Alexander Solzhenitsyn, author of The First Circle and other great novels and nonfiction books. On this day in 1918, Alexander Solzhenitsyn is born in the Caucasus Mountains in Russia. Solzhenitsyn’s father, an artillery officer on the German front in World War I, died before Solzhenitsyn was born, and he was raised by his mother, a typist. He began writing as a child but studied mathematics in college because there was no suitable literature program in the town where he lived, and he and his mother were too poor to move to Moscow. However, he did take correspondence courses in literature. During World War II, Solzhenitsyn was assigned to an artillery unit because of his mathematics background. He was put in command of the company until 1945, when he was arrested for writing a letter that criticized Stalin. He spent eight years in prison and labor camps, after which he was exiled to Kazakhstan for three years. He taught mathematics and physics and continued writing secretly for many years, not even letting his closest friends know about his writing. He was convinced his work would never be published. However, in 1961 he finally let go of his secret, and published One Day in the Life of Ivan Denisovich, a short novel which became an instant success, followed by a collection of short stories in 1963.